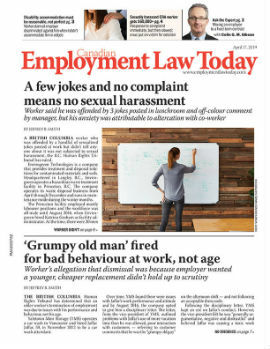 An Ontario employer wrongfully dismissed an employee who wanted to return to work after several months of sick leave, an adjudicator has ruled. Dinesh Sharma worked as an office clerk for Beacon Transit Lines, a regional carrier of fresh, frozen and dry goods based in Brampton, Ont. She was hired in October 2001 and worked until October 2012, when Sharma informed Beacon that she would be taking time off to heal an injured arm that had been bothering her for two years. She indicated she would be receiving workers’ compensation benefits, though she didn’t submit a claim until the day after. A week later, on Oct. 31, she submitted a form to Beacon that was required as part of her workers’ compensation claim. On Nov. 8, 2012, Ontario’s Worker Safety and Insurance Board (WSIB) determined Sharma’s injury wasn’t work-related and rejected her claim. Beacon had told the WSIB it was not aware the injury happened in the course of her employment, just that she had said she had pain in her arm.